‘Save Kids Lives’, directed by Luc Besson, is a powerful call to action for safe journeys to and from school for every child. Support the #SaveKidsLives campaign by signing the Child Declaration for Road Safety at www.savekidslives2015.org. Safe Kids Oakland County, MI worked with throughout the 2014 - 2015 school year to implement pedestrian safety and distraction education and awareness to students at Southfield High School. The students of Patterson Park Public Charter School in Baltimore take action against distraction. Kids from around the world deliver a video message to international leaders to support global road safety and the urgency of this emerging epidemic. Gary Karton hit the streets of Washington D.C. to talk with teens about the dangers of distracted walking. Make Halloween scary for the right reasons. Gwen Ward talks about the tragic loss of her daughter, Christina, due to injuries suffered from being distracted while walking. 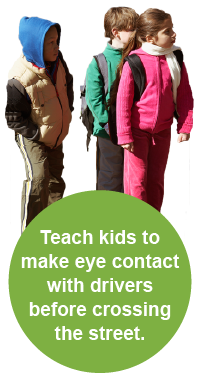 Commit to walking safely when you cross the street. Safe Kids and FedEx work together to make a school more safe.